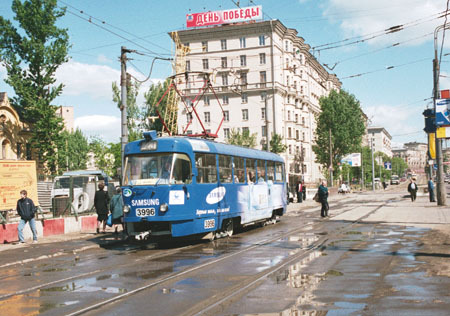 The tramway line along Begovaya Street started service in the end of 1929, and the last day of the line was May 25, 2002. 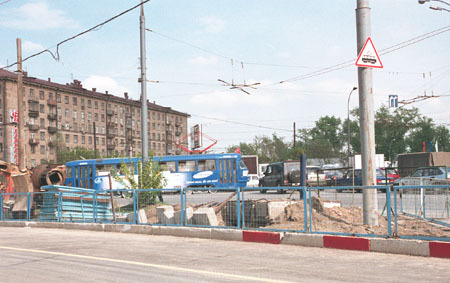 Begovaya Street has been targeted to become a part of the Third Ring Highway, and the tramway tracks hindered the construction. The city administration planned to lift not only the tracks in Begovaya, but also the line along Leningradskiy Prospekt (in fact, this is the same line today, as you can figure out from the map) claiming that there were no loops. But an unbelievable miracle has happened - after a massive pro-tramway campain organized by a Muscovites for Tramway informal group, with rallys and discussions in mass-media, the administration suddenly decided to build a loop (not previously planned) in 1st Botkinskiy Proyezd. 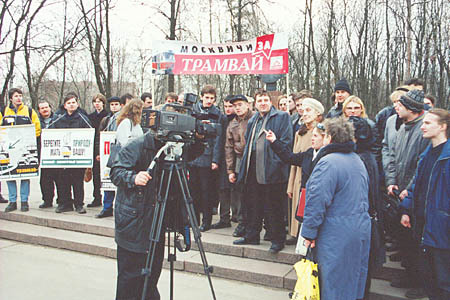 Using the newly built loop, the line in Leningradskiy Prospekt continued service until 25 December 2004, when the reconstruction of Leningradskiy Prospekt itself began. The plans are to convert that already very broad avenue into a super-highway with 8-10 lanes each way. 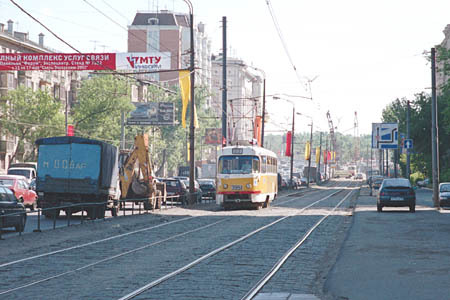 Tramway tracks crossed the junction of Begovaya Street and Khoroshevskoye Shosse. This rather busy junction made a lot of problems because jammed cars often barred the trams, and (strange but true) there was no traffic-lights here. This shot was taken when the reconstruction of the junction had already started - note thet former trolleybus overhead hangling idly (the trolleybuses had been rerouted to bypass the site). 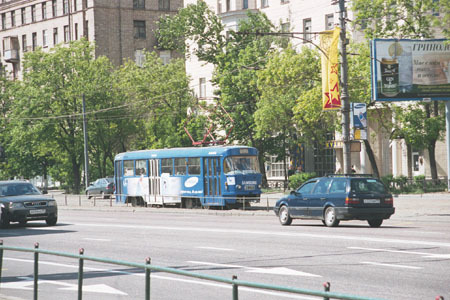 Ulitsa Polikarpova tram stop. There was (and is) an underground pedestrian tunnel with convenient exits to the stop. Now, as the street has to be expanded, those exits are to be barred, and the tunnel itself is to be reconstructed. 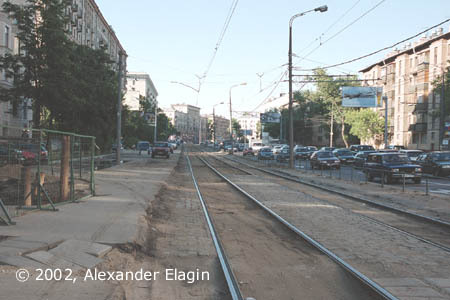 Tracks along Begovaya Street were paved with brickstones. 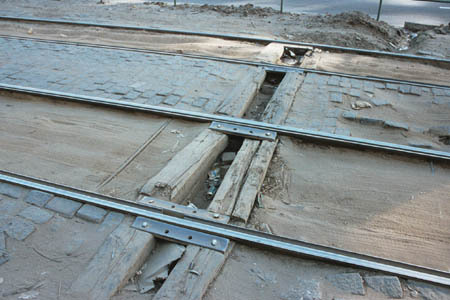 This pavement has almost disappeared from Moscow streets in 1990's - during the reconstruction of the tram network bricks were replaced with concrete slabs. Note that bricks had partly disappeared from this line, too, even while it was still in service while I took this photo. A view of Begovaya Street between Polikarpova Street and 2nd Botkinskiy Proyezd. The same place, but now viewed from the other side of the street. To the left one can easily recognize a usual evening traffic jam, but trams, of course, ignore all jams running on their own lanes... while buses and trolleybuses are stuck. One of the former drains in Begovaya Street line.